Cabrinha Cape Town has the best kiteboarding gear, lessons and location for the ultimate kitesurf in Cape Town. 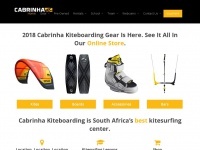 Our kitesurfing shop in Cape Town is also online. three profiles were found for Cabrinha.co.za in social networks. Among other social networks the website is represented in Facebook, Twitter and GooglePlus. The web server with the IP-address 41.185.8.188 used by Cabrinha.co.za is run by Web Africa and is located in South Africa. This web server runs a few other websites, mostly in the english language. The websites of Cabrinha.co.za are served by a Apache server. The online shop was build with software WooCommerce in the version 2.6.4. The HTML pages were created with the latest standard HTML 5. Due to the robot information on the webpage, the following actions by webcrawlers are not allowed: using the description of the website from the Open Directory project. All other actions by webcrawlers are allowed. Seabreeze.com.au - Seab­ree­ze - Austra­lian Weat­her Fore­casts & Live ..
Kiteshop.com - ! A Po­wer Kite Shop - Po­wer Kites Kite­boar­ding ..
Kiteboarding.org - Kite­boar­ding, Snow­kiting and Kite­surfing Gear @ ..